November | 2013 | Killed in a Smiling Accident. Black. Black! Like the clouds of death that follow me into the Forest of Doom! And hide in the wardrobe of darkness! Today’s challenge, should you choose to accept it, is to Write An Episode Of MacGuyver Or The A-Team Where They’re Trapped In The Black Friday Warehouse And Have To Escape Using Only cricket leg pads, a window mounted bird feeder, a box of twelve ballpoint pens, a floating bath thermometer and clock, a squash racket, a Plant Theatre Funky Veg Kit and an IPL Hair Removal System. Submissions in by midnight, please, and the mandatory puns of the day are “Well that was a close shave! !” (IPL Hair Removal System) and “I guess he couldn’t take the heat! !” (floating bath thermometer and clock). This entry was posted in melmoth, waffle, zoso on November 27, 2013 by Zoso. It’s a busy old time for virtual pilots of World War II(ish) crates with World of Warplanes hitting official release this week and War Thunder ramping up for its launch on the PlayStation 4 and the addition of ground forces. I popped back in to the World of Warplanes open beta last month when they added British planes, and patched it up for release a couple of days ago. The controls certainly seem to have improved from earlier beta versions so WoWP is perfectly fine for a bit of flying-type fun, but not enough to displace War Thunder as my dogfighter of choice. Still, I’ve got a bit of premium time left from tokens earned during the beta, so I’ll at least try to use that for a bit of a leg-up towards a Spitfire. I won’t be going all out to be First to the Top, though, that way madness lies. I didn’t think it was a particularly good idea when Blizzard started handing out server first achievements, and that was without an incentive like ten years of premium account time. As a canny marketing stunt/completely coincidental bit of timing/evil underhanded plot, Gaijin are also dangling a carrot to encourage War Thunder players to jump through a few in-game hoops, offering players the chance of participating in the closed beta test for ground forces by completing daily challenges over the next three weeks. The first challenge, to destroy 60 ground targets, was pretty straightforward. The second, to shoot down 35 opponents, was rather trickier as you had to be flying one of five specific aircraft (one per country), which made Arcade battles a little unusual as many players quit after losing their challenge aircraft rather than respawning. Today’s was better, shoot down 30 fighters, sorted out with a few trips back to low level furballs. I won’t be going mad to try and complete every challenge, but it’s quite fun mixing up the type of aircraft you fly and way you play to at least have a crack at different challenges. The announcement also offered a hint at dates, “The testing itself is currently scheduled to start before December 4th”, so it looks like tanks might be coming in early 2014. I had a brief peek at the forums to see if there might be any more hints, but after seven pages of frothing excitement, bitter complaints and animated GIFs I had to close the browser window for fear of developing photosensitive epilepsy. More positively on the forums there’s a rather splendid British Tech Tree Project, a collaborative effort that’s produced an impressive looking possible tree. Aircraft suggestions usually range from “You know that plane, yeah? The one with the guns and this and that, yeah? That would be all amazeballs they should totally put that in the game, you know what I’m saying?” to “Gaijin must implement pastes Wikipedia list of all military aircraft 1934 – 1952“, but this group have taken the time to sift through the possibilities, assemble cohesively themed branches with suitable ranking and produce a graphical version of the tree in keeping with the in-game interface. Most impressive. 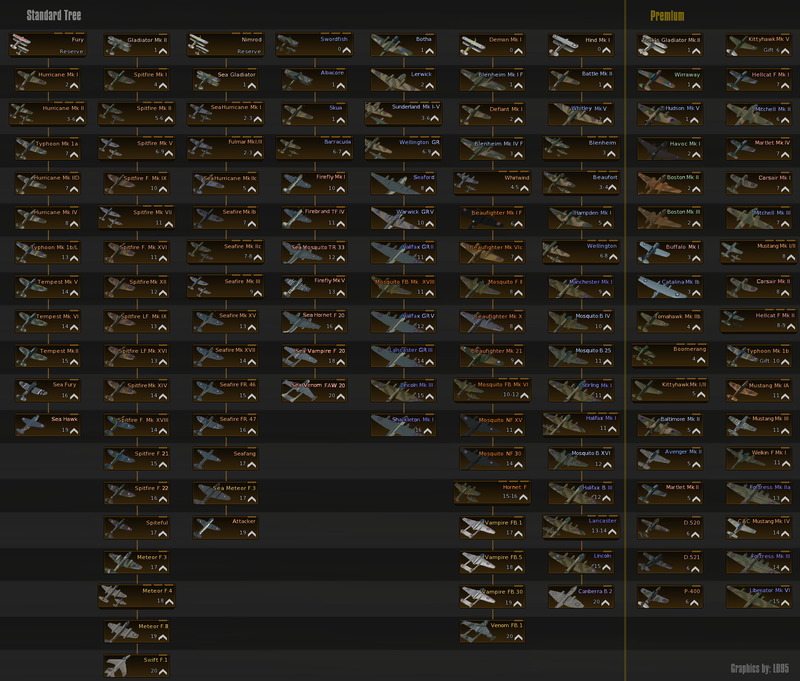 This entry was posted in war thunder, world of warplanes, zoso on November 15, 2013 by Zoso. Cosmetic items are an important element in many free-to-play games, offering a chance to earn a bit of money from item shops without disrupting game balance, and Hawken is no exception with several chassis components available to change the way your mech looks. Unfortunately there are no hats, rather a shame as I think giant battlemechs would look quite dashing wandering around in a fedoras or trilby. It’s doubly unfortunate as Hawken also offers emotes for its mechs, and the combination of a top hat plus a hat-tipping emote, ideally accompanied by a cry of “I bid you good day, sir!” would be a splendidly gentlemanly way of greeting friends and dismissing opponents. In fact you could get rid of that beastly shooting business altogether, I’d be perfectly happy just to wander around a map tipping my hat to other robots, rather like Charlie Brooker’s Pleasant Neighbourhood Simulator, only better, as it’s a scientific fact that giant robots improve anything. Speaking of good manners, Twitter was set all of a fluster recently with news of a Kickstarter Project, Ever, Jane: The Virtual World of Jane Austen. An intriguing prospect, an MMO based around gossip and dinner parties instead of swords and dungeon crawls, I’m hoping the project secures enough funding, although the high tier rewards make me a touch wary; for $1,000, for example, “… your own estate rather than a cottage, the title of Baronet and your estate named after your character” smacks a little of pay to win (or perhaps more accurately cash for honours). It is a truth universally acknowledged, that a single man in possession of a giant battlemech, must be in want of a wife. And a shoulder mounted gauss rifle. At Netherfield Park the Fotherington-Autocannon family prepare to receive the visit of Colonel Short Range-Missile with considerable excitement. Bzzzt-whirrr “WHY MAMA, DO YOU SUPPOSE THE COLONEL MAY CONSIDER ELINOR A DESIRABLE COMPANION?” said Marianne. At this, Elinor became most flushed and did increase her coolant flow. “UPON MY WORD, I MUST OBJECT” she cried and spun upon her heel, activating jump-jets to leave the room, resulting in a tumble of lathe and plaster as she smashed through the ceiling. At this moment a great crash from outside signified the arrival of the Colonel’s dropship, setting a swathe of lawn afire and crushing several petunia bushes in the process. The ramp descended on the remains of a laurel hedge and the Colonel deployed to the drawing room. “MRS FOTHERINGTON-AUTOCANNON, MISS FOTHERINGTON-AUTOCANNON, MISS FOTHERINGTON-AUTOCANNON” said the Colonel formally, raising his robo-hat to each. Mrs Fotherington-Autocannon fell into a swoon, knocking over two bookcases and a sofa as Colonel Range-Missile hastened to her aid. Elinor clasped her sister’s pulse lasers between her own. This entry was posted in waffle, zoso on November 13, 2013 by Zoso. I’ve been a fan of BattleTech games on the PC for a long time; my original 8086 wasn’t quite up to running BattleTech: The Crescent Hawk’s Inception or the first MechWarrior game, but I played through BattleTech 2: The Crescent Hawk’s Revenge (a splendid early top-down real-time tactical game) and the two MechCommander games that came later, and the excellent MechWarrior 2, 3 and 4 plus expansions. A couple of years ago MechWarrior Online was announced, last June they put Founders packages up for sale, and I was rather tempted. The trouble with pre-launch offers such as Founders packages is that if you plunk down a wodge of cash on an amazing never-to-be-repeated offer then Murphy’s law dictates you’ll end up not really liking the game (or the company implodes before launch, or they offer the same benefits for half the price later, or…) Course if you cunningly sidestep that issue, by ignoring pre-launch offers entirely, Murphy still gets you, as you wind up trying the game sometime later, you find it’s amazing, and bitterly regret missing out on a great value offer that will never be made again. Still, reasoning that I liked both the previous MechWarrior games and also World of Tanks (which MechWarrior Online broadly resembles, only with Mechs instead of tanks oddly enough) it seemed like a fairly safe bet, and I opted for one of the packages. Needless to say I’ve hardly played MechWarrior Online, only clocking up a few hours of giant robot gerschtomping in the past year. The path of development doesn’t seem to have been completely smooth; a slashdot article suggested discontent within the community over features such as the introduction of a third-person view. I suspect it’s something of an overreaction from highly invested fans to decisions made by Piranha Games trying to balance sometimes mutually exclusive requirements of disparate elements of the player base (and potential new players), perhaps exacerbated by poor communications. On the Internet in general though, and with gamers particularly, a Cyclops suffering from Alice in Wonderland syndrome looking at an M C Escher picture has a better sense of perspective (typical starting point: minute adjustment to the reload speed of a gun = LITERALLY WORSE THAN HITLER), so without deeper involvement it’s hard to distinguish between brave consumers standing up to malicious or incompetent developers, a bit of a storm in a teacup based on some genuine concerns, or the deranged rantings of a tiny group of lunatics (and that’s before bizarre comedic-perfomance-art-installation-protests confuse matters still further). MWO was officially released in September after a year or so in beta, and the PC Gamer review certainly chimes with my admittedly limited experience, solid mech-on-mech action but a lot to get to grips with and a rather clunky out-of-combat interface. Not insurmountable issues by any means, but with a plethora of other drop-in vehicular combat options like World of Tanks, Planetside 2 and War Thunder, MWO hasn’t really hooked me in yet. Apparently there’s going to be a “UI 2.0” revamp, hopefully that might make it a little easier to get into. There’s also a giant stompy robot rival in the shape of Hawken; I first heard about it during last year’s E3 where MWO had a crazy controller, the Razer Artemis, and Winged Nazgul pointed out the Rogue Mek-Fu for Hawken in a comment (sadly the controllers don’t appear to have made it to market). Seeing as I already had one Mech game I wasn’t playing I didn’t see much point in trying another, but in its most recent patch Hawken introduced a co-op mode against AI bots, which got Melmoth interested (despite being terrifyingly lethal in Planetside 2 with a k/d ratio to match, he’s not such a big PvP fan), and he extolled its virtues so I thought I’d give it a shot. Hawken takes a different approach to mech combat, somewhat stripped down (e.g. two weapons per mech, a health bar rather than armour and damage per location) at a much faster pace, lots of dodging and boosting. It’s very straightforward to hop in and get to grips with. I’m sure there are plenty of forum and comment skirmishes between advocates of the two games putting forward balanced, well-considered and rational arguments over the pros and cons (ha! ), the Ten Ton Hammer comparison seems well balanced. I think I might drop in to Hawken now and again for a spot of high tempo robo-blasting, and if War Thunder starts to pale then maybe take a closer look at Mechwarrior Online again in the future. This entry was posted in hawken, mechwarrior online, zoso on November 6, 2013 by Zoso. Gaijin are celebrating the birthday of War Thunder by giving away presents rather than demanding them; there’s a discount on plane packs bought through Gaijin, experience bonuses, some in-game plane discounts, that sort of thing. Particularly good value is 50% off a full year of premium account time, bringing the price down to 7,600 Gold Eagles. How much that costs in actual money depends how you buy those Gold Eagles; if you haven’t already bought the Ace Advance Pack on Steam it’s a really good deal, it includes 10,000 Gold Eagles (enough for the discounted 12 month option with a bit left over), a couple of useful premium aircraft and two months of premium account time that stack on top of any existing time, all for £24.99 (the Gold Eagles alone would cost about £40 if you bought them direct). If you’re fairly confident that you’ll be playing for the next year that’s not a bad deal at all. Unfortunately someone is being a bit of a party pooper at the moment and launching a DDOS attack on their servers, but hopefully that’ll be sorted out before too long, as the discount premium offer only runs to 6AM (GMT) November 4th. This entry was posted in war thunder, zoso on November 2, 2013 by Zoso.